as definite as black . . .
as when He paints in white." Do you have days when you feel pale? Not blue, as in depressed, but pale and wraith like. I'm feeling that way today. Not sad. Just sort of ... pale. Drifting through the day. Mellow, but pale. Company's gone. Husband's busy with a project. Church in the morning, then studying, a long walk, and more studying. Linking to Mosaic Monday hosted by Mary at the Little Red House where you are sure to find more exciting and colourful mosaics than this one! Yes, I may have had that feeling. Perhaps when I was finishing up my studies and a degree would soon be in hand. I wasn't feeling that way today because I was working on a project that was seriously not going well. It's complete and I'm bushed. No, I was too red today to be pale. Yes, yes, I know that feeling..... Thanks for the Chesterton quote -- he really had some wonderful sayings. Glad they are preserved for our enjoyment. And thank you for your lovely posting. I do feel that way sometimes, and I feel better if I express it. You have expressed you feeling in such a beautiful way! You have just captured my day... pale is the perfect description, not depressed, not blue, just kind of pale. Love the mosaic! White can be such a stunning color. Sweet, delicate and glorious all at the same time. This is, once again, a beautfully done mosaic. Glad you were unperturbed by the "pale" day. A beautiful mosaic and I did see a 'green' egg in there. I used to call those days, 'cloud days' as I felt as though there were no edges, I was just drifting, changing. Though I'm not sure feeling pale is a good thing...you made a most lovely post from your collection of whites. I know what you mean. It is one of these by-products of autumn and diminishing light. What about a cup of hot chocolate, but the dark intense one made with pure chocolate. Love these photos, my favorite is the tree trunk. Amazing! It seems a positive feeling to me. Your description sounded very peaceful. You had let go of world and the clutter. Drifting in the present. It reminded me of some of the mental states described in Buddhist teachings. Perhaps, after all your company, your mind simply found refuge in "drifting" through the present. Je connais ce sentiment... je crois qu'il vient beaucoup avec les premiers vrais jours d'automne. Tes photos sont magnifiques, et cette souche, au début j'ai cru qu'elle avait été peinte en blanc ! Mais non, c'est la mer et le vent qui l'ont délavée ! Impressionnant ! 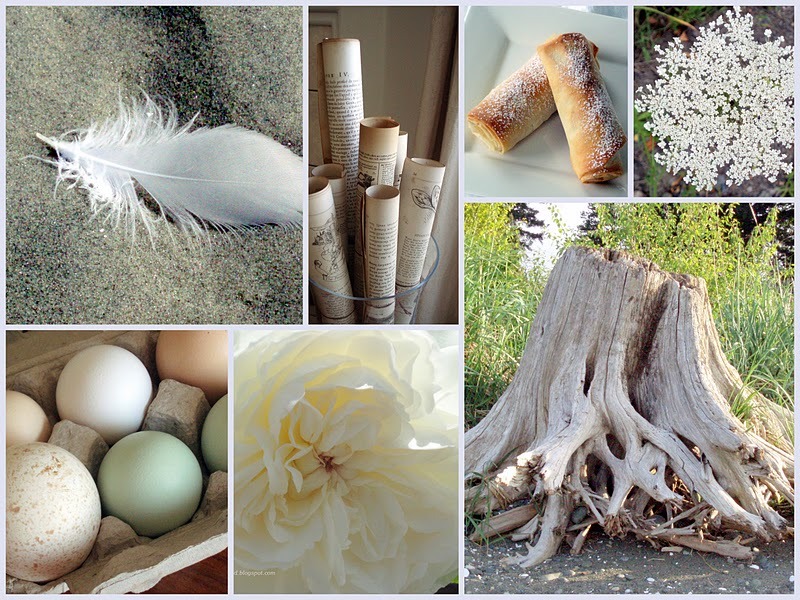 What a wonderful post with beautiful images, Lorrie! And a lovely poem! I do hope that you 'pick_up' from paleness! And when family members have left us there is always a whole for a while, but it will be filled up again! Your post reminded me of the 60's song "A whiter shade of pale". Now I can't get it out of my brain. Beautiful mosaic with many shades of white. I don't think I've ever had a pale day, blue & sad yes but not pale. we all need quiet days, that's what makes us more effective for the loud ones! Love the tree roots (looks like they have been ocean weathered) and the pastries.